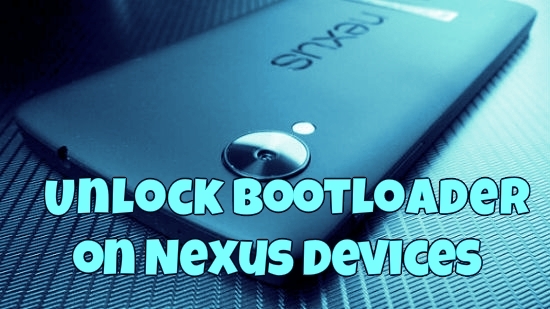 By unlocking the bootloader on Nexus device like Nexus 5, Nexus 7, Nexus 4 etc you’d be able to install root and custom recoveries on your device. Without unlocking it you can’t do these task on your nexus devcies. The process of unlocking the bootloader is similar between all Nexus devices and works same on all the same devices. Remember one thing by unlocking the bootloader of your device you will those all the data from your device, do take the backup of your device first before following this guide. In this guide we’ll show you how you can do this easily. To get started all your need the nexus drivers and fastboot files. Just follow everything mentioned below and you can easily unlock the bootloader of your Nexus device. If you have a Nexus device (Nexus S, Nexus 4, Galaxy Nexus, Nexus 4/7/10, new Nexus 7 etc), you can easily unlock it using the guide below. WARNING:- Warranty may be void of your device if you follow the procedures given on this guide. As we mention above to get started first you have to install the nexus drivers on your system. Download and install the nexus drivers from here. Read here our complete guide how to setup Nexus drivers on your system. Step 1. Download the fastboot files for your Nexus device here and extract the folder on your desktop. Step 2. Enable the USB Debugging mode on your device, Go to the Settings » select About device » Scroll to the bottom and tap on “Build number” seven times to enable developer options. Now the developer option is visible on your phone settings. 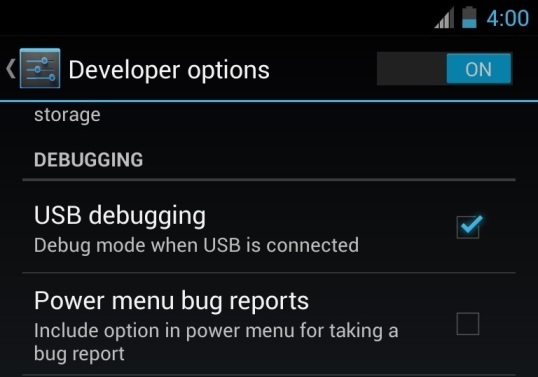 To Enable USB Debugging again go to Settings » select Developer options » Tick the “USB debugging” checkbox (under Debugging section). Step 3. Switch off your phone and boot it in bootloader/fastboot mode. To do this Hold Volume Up Key + Volume Down Key and then press the Power button. Step 4. Now open the fastboot folder on your desktop, the same folder that you downloaded on the step 1 above. Press Shift key + Right click on any empty space inside the folder, and select Open command window here. Step 5. Now connect your nexus to the PC with the help of USB cable and type fastboot devices in the command prompt window. This command will list the connected devices. If your phones serial number is not listed on the windows, it means your drivers are not installed correctly. reinstall the drivers again or Change the USB port. Step 7. 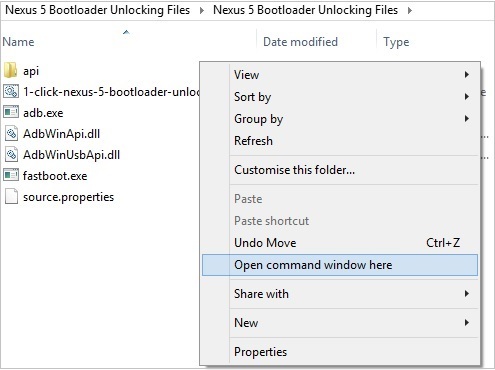 Now you will see the warning message on your nexus device to confirm whether you really want to unlock the bootloader of your device or not. 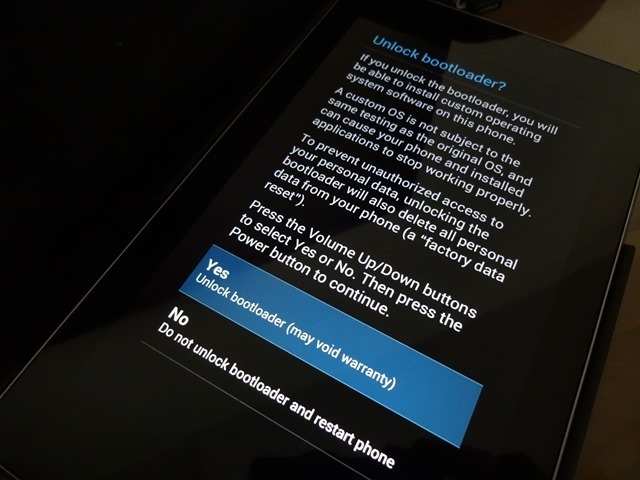 Accept the bootloader unlocking request by selecting Yes using the Volume button and then press the Power button to confirm. Once the device has been unlocked, it will automatically reboot into Android. Now you device has the unlock bootloader.